When it comes to electric car motors, the most commonly asked questions start with: "How many horsepower...?" How many horsepower do I need to get on the freeway? How can a 20 hp electric motor do that, when my little 4-cylinder Corolla has a 120 hp engine, and barely gets up the hills? How many horses do I need per pound of car? 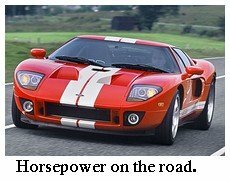 Why does the same electric car motor have different horsepower in different conversions? I don't get that. What's the deal on "continuous horsepower" and "peak horsepower" ratings? 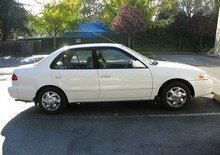 The Corolla question (why does my Toyota need every single one of its 120 horses to push its light little body around, while a 24hp WarP 9 in the same car would give it twice the pepper? )...well, that's easy. It's just that the answer kind of makes you want to shake your head and blink. When you hear that electric car motors are more efficient than gas-guzzlers, this is what we're talking about. What we mean is "a LOT more efficient". Most of your Corolla's 120 horses are being used to get from 0-35 mph, which gas engines are not that good at - it takes them a while to find their torque. Electric car motors (especially series wound DC motors like that NetGain WarP 9), on the other hand, have a particular talent for low-end acceleration, which is just one of the many reasons we love them! When you're selecting electric car motors, figure 6-8hp (continuous) for every thousand pounds of finished, loaded vehicle weight. That means figure in the car's curb weight - along with the load of batteries, corn-fed American passengers, and the trunk full of camping equipment. Seth sez: "More horsepower is required for higher speeds, heavier vehicles, and steeper terrains." 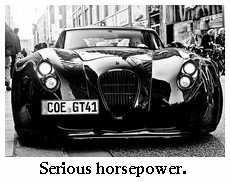 Translating "gas-guzzler engine horsepower" to "electric car motor horsepower" feels a little like translating English to Japanese - not a lot of words in common! Once again, it's - mostly! - all about the voltage.